I guess you can say I’ve had Korea on my mind lately. While living there, I was lucky to be one of a few tourists to venture up north. Yes, that north: the Democratic People’s Republic of Korea aka North Korea. There is much curiosity surrounding North Korea. Virtually isolated from the rest of the world since the 1950’s, the country can only be visited on an organized tour. Even then, only certain regions are open the the non North Korean public. Kŭmgangsan is one of the most popular. Tours to the mountain region 50 km from South Korean border are few and far between. 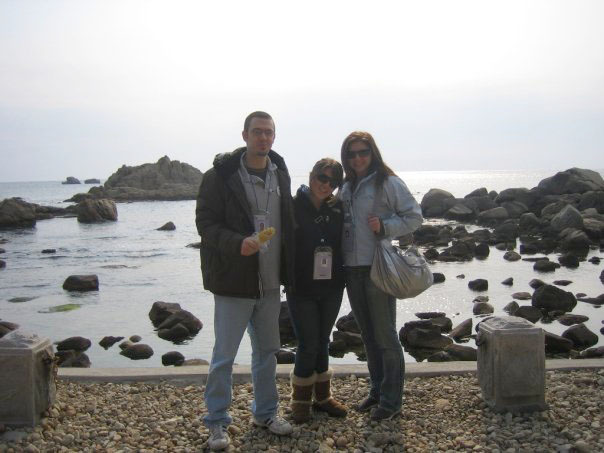 Scott, Melissa and I jumped at the first open opportunity through South Korean tour company Adventure Korea. The weekend was an interesting one to say the least. Tourists to the region must remain with their tours at all times. Taking pictures out of the bus or of locals is strictly prohibited as is talking to any North Korean other than the trusted guides. US dollars are the only accepted currency though wearing any USA paraphernalia (also South Korean or Japanese) is against the rules. Even with the stringent regulations imposed on visitors the chance for a glimpse into this hidden world is worth the trip. A bulk of our time in the DPRK was spent hiking. 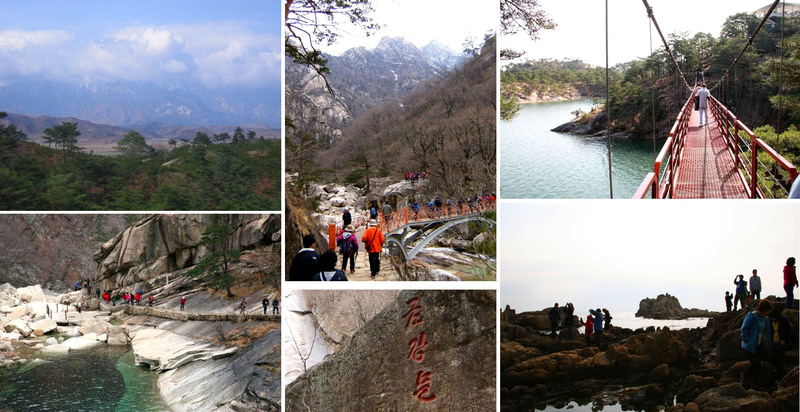 As mentioned in the Seoul post, Koreans love to hike. This is no different in the country to the North. The mountain ranges are stunning: the high peaks are juxtaposed with the open ocean, turquoise lakes and big blue sky. Tour buses travel in packs to the various open destinations in Kŭmgangsan. As the buses pass, villagers are forbidden from leaving the gates to their towns and must lay flat if in the fields doing work. Guards standing 100 feet apart line the roads diligently watching to make sure no tourist snaps a pic. If a camera flash is caught, a guard will board the bus and make sure any illegal image is destroyed. Nighttime activities include a highly organized (and impressive!) acrobat show. 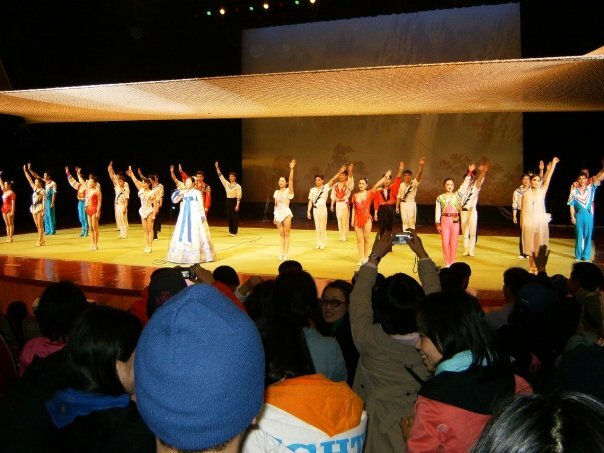 The performers are chosen from around the country as children and spend the rest of their youth training and performing acrobatics for tourists and international competition. Note: On the morning of July 11, 2008, a 53-year-old South-Korean tourist was shot and killed while walking on the resort’s beach. 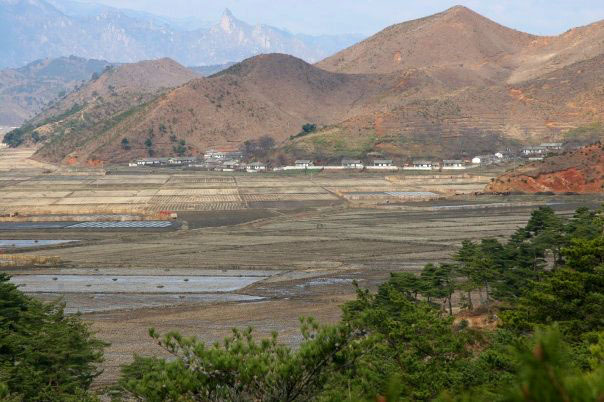 Wang-ja entered a military area by crossing over a sand dune and was shot twice by North Korean soldiers. Due to the shooting, South Korea suspended all trips to Kŭmgangsan and the DPRK now only permits companies to run tours from the North Korean side of the border.